Has somebody been reading DOTEATCOO recently? Extremely low-pitched sounds from electronic devices and other things as well as from nature, which cannot be perceived by the human ear – so-called infrasound – can cause strong vibrations, in the case of objects and with the human body and all its organs, such as, for instance, also in the eyes. The consequences of that are hallucinations and panic attacks as well as depression, discord and negative moral states, because the thoughts and feelings as well as the consciousness succumb to confusion as a result of the vibrations. In the said form, there is a connection among infra-sound, electromagnetism, and ghostly apparitions. Infrasound and electromagnetism can trigger the internal attack-and-escape mechanism of the human being as well as panic attacks and hallucinations, and so forth, and it is especially the case if one is in a spooky or weird-looking place, in a depressed mood or in a mystical situation, and so forth. That which is decisive in this regard is that the sense of the human beings is under great tension, whereby he perceives the environment and his situation, and so forth, as a threat. In this state, then “ghostly apparitions” can be seen or strange, ghostly sounds can be heard, or unreal touches can be felt, and so forth. Strong electromagnetic fields have effects on the human body and its organs, which therefore also includes the brain and consciousness as well as the thoughts, emotions and the psyche, which lead to hallucinations, whereby the human being sees, hears and feels things which are not real. Electromagnetism and infrasound produce an effect on the human brain in such a way, that, for example, the feeling is created that someone strange is present – a ghost, and so forth, because he cannot be seen, or can be dimly seen as a result of the imagination. Faces and figures can also be seen and sounds as well as unreal breathing, and so forth can be heard, or, in the same way, unreal touches can be felt. Thereby the human being can become increasingly insecure and anxious, because the activity of fantasy and the imagination increases and everything is considered absolutely real, as for example in a similar manner to the way human beings appear who believe that they have been abducted and examined or impregnated by extraterrestrials and later have their foetuses stolen, which, in regard to pregnancy, naturally, only applies to women. With all of these human beings, fantasy and the imagination – so to speak – go mad, whereby everything is of such a strong nature that the fantasy images and the imagination appear absolutely real – all caused by infrasound, or by strong electromagnetic fields. FYI: The profiteers live off the Lemmings. WARNING: Note all the mumbo jumbo and direct inaccuracies. except Jordan Sather, who is more grounded but still follows the DW CG LO1 cult. They do correctly predict that women will help balance the planet in the future, but of course use vague woo woo terminology. And the breaking news from the mainstream science community? Add it to the list of things that Billy Meier has told us, in writing, years or decades before we hear about it as a new scientific discovery. We would like to inform you about some organisational innovations which will allow special facilities concerning the performance of your meetings/assemblies as well as meditations in a group or individually. …If the life is viewed and considered in all its situations and variations, then it can be recognised that life means a constant struggle, a continuous careful study of one’s own innermost (self) and outer self. The innermost self, which exists in the deepest consciousness, reflects the values of the creational spirit, but in opposition to that, the human being forms the outer self, the outer personality, according to his/her own views and understandings, by means of his/her thoughts and feelings and will. And, as a rule, this outer self, this outer personality, which is also released outwardly in the environment as one’s conduct, completely contradicts the innermost self which has a creationally-given nature. …The human being’s innermost, spiritual-creational self is his/her most precious possession, the most valuable pearl of his/her life, the greatest of all treasures concealed in him/her and the greatest value that he/she carries around with himself/herself. His/her innermost self, his/her true self, which has a creational nature, is the true stone of wisdom. It does not consist of silver, gold or precious stone, rather, it consists of creational energy and true creational love – constantly ready to penetrate the human being’s deepest consciousness and also his/her external consciousness, so that he/she listens to it and orientates himself/herself accordingly, in order to live in the creational-natural sense, to be progressive and to fulfill his/her life according to the laws and recommendations. But the human being almost never listens to the call of the innermost spiritual-creational self and only seldom feels its pulsating impulses which call upon him/her to really live, to be human, to create knowledge, true love and wisdom, and to be evolutive. …As a human being, one must never forget the sense of the life and never the existence of the innermost self. Only in one situation – namely when one is overcome by current events or if one is occupied with things that are established outside of the high values of the sense of life and of the innermost self – may one sometimes briefly give oneself over to forgetfulness. So, it does not mean that one must constantly only dedicate oneself to the evolution, rather that one has the freedom to occupy oneself also with different, and purely worldly, things. Yet one ought to always be mindful of this: that everything worldly is only a concurrent matter in the happenings of the sense of life and thereby in the happenings of the evolution – a matter which is indeed necessary, but which ought never to be overvalued. If one lives correctly, the life consists of a fascination about the eternal becoming and passing, and of the constant up and down and back and forth of all necessary things and motions, which call forth transformations and which are required for the entire life and evolution, as well as for the everyday life of the human being. Yet, for the human being, along with the material existence, exists the existence of the spiritual-creational, which is the actual and true life. Therefore, for him/her, the single hope is that which is inescapable, and the higher, joyous Ziel of going over into the next highest level, where, however, all instruction and all learning continue. Therefore, the human being must always – and even right here and now, in this moment – make the effort to do his/her duty. 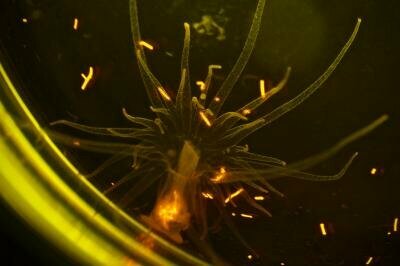 Tiny fragments of plastic in the ocean are consumed by sea anemones along with their food, and bleached anemones retain these microfibers longer than healthy ones, according to new research from Carnegie’s Manoela Romanó de Orte, Sophie Clowez, and Ken Caldeira. “Plastic pollution is a serious and growing problem for our oceans and the animals that live in them,” Romanó de Orte said. The Trilaner left quite an impression at the SSSC. How Did Meier Know Long Before the Scientists? What do the ET’s want to teach us? Are Pacific Garbage Patches Natural or Man Made? Is Jordan finally getting it?